I would like to share some date and value tips on how to invest money in antique jewelry that I have picked up over the years as an antique dealer at Years after Year. To wear and enjoy a beautiful piece of antique and vintage jewelry with history can be a wonderful, exhilarating experience. For many it is an addictive hobby. The more you collect, the more you want to collect! It's that exciting! But when buying these jewels of yesterday, how can you invest money in jewelry antique and be certain that what you are buying is authentic and not relatively new and worth its claimed value? The following date and value tips will help. From my experience, one of the best date and value tips, is to buy from reputable dealers who guarantee their items. Attend Antique & Collectable Shows, browse Antique Shops and read jewelry books to familiarize yourself with period styles and their findings. When looking at a piece, examine it carefully both front and back. A genuinely old piece will have all the ingredients to confirm its authenticity. Many jewelry styles do tend to overlap so always check the entire piece for clues. One of the most obvious date and value tips is antique jewelry marks. Is the piece signed, hallmarked? Surprisingly enough, a lot of antique jewelry was marked in the most unusual of places so check along the edges, inside of the bale, the pin stem and even on the back of the pin stem! You'll be amazed at what you could find and where you will find it. Suddenly a piece of jewelry that you thought was newer or made of silver plate or gold plate now may be seen in a different light as genuine antique silver or gold with another store of value! A lot of old jewelry such as Victorian Jewelry was not marked. So now what, how can you work it out if there are no date and value tips to go on? OK. A Victorian brooch with a long pin stem extending outward is a good indication that it's early Victorian while a shorter one is of a later date. The "C" clasp is another indication that the piece is old. Remember that there are always exceptions to the rules since the "C" clasp was also used later on in Europe so take every detail into account to come to your full conclusion. Look at the hinge and the clasp of a brooch, bracelet, necklace, etc.. Does it look like a clasp used today or does it seem a bit different to you? Compare new pieces to old pieces. Does the jewelry have a brass spring ring clasp from the 1930s or a shiny gold plate clasp? Are the findings on a piece consistent with the design of that era? These small differences could answer your questions and drastically influence the value of a piece. The tube hinge was generally used until the 1890s where the safety catch clasp became popular in the Art Deco 1920s period. Over the years the appearance of the safety catch clasp has changed so it's good to recognize the old from the new. Many clasps on old jewelry such as pins broke in time so replacement ones were soldered onto the back. All better Jewelry is soldered at some place but if the piece has raised pads soldered to the back of the Brooch where the clasp is attached then it is a replacement clasp. Poor jewelry repairs will impact on the value. Another good clue to dating a piece and determining the value of Antique and Vintage Jewelry is to look at the metal content where there might be some underneath wear, usually in back where it would rub against the clothing. Some other date and value tips that I've learned over the years are that often Genuine Gold and Silver, even if it has wear, will not show a base metal underneath since it continues all the way through. Many costume pieces from the nineteenth century and into the Art Deco period were made of gold and/or silver over base metals such as gold over brass, silver over brass, silver over copper, gold over copper, etc. That's one way of knowing the piece is at least 60 years old and more. During the war years of the 1940s there was a shortage of base metals where it affected the jewelry industry so sterling silver was substituted. If you see a marking such as "1/20 12K on Sterling" then 1/5 of the piece is 12K gold and is likely to be from 1942 to 1945. Vintage Bakelite which is a Polymeric Plastic invented by Leo Hendrik Baekeland in 1907, became popular in jewelry design during the hardships of World War II also. There are several tests in determining Authentic Antique and Vintage Bakelite Jewelry using Formula 409, Hot Water, Simichrome Polish and a Q-Tip. Still, some Bakelite such as Black Bakelite may not test positive. Since Bakelite is either cast or molded it would not have a seam line anywhere and the workmanship should look hand carved and not be crudely executed as if a stamp was used. On Vintage Bakelite brooches, the clasp would be embedded into the piece. Fine Jewelry containing Diamonds or Precious Stones such as Rubies, Emeralds and Sapphires are either bezel-set, inset or set with prongs and will always have open-backs for maximum brightness. Air bubbles seen in stones is a clue right off that the piece is glass. Marcasites which were substituted for diamonds as early as the 1700s, regained it's popularity in the 1920s and 1930s. A higher valued marcasite piece would have better workmanship where each marcasite would be set with tiny prongs or beads versus glued in ones and because of this the stones will stay in place longer. This is also true for Rhinestones in Vintage Costume Jewelry, where prong set ones are valued higher than glued in ones. These are just some of the many date and value tips to help you learn what to look for when buying Antique and Vintage Jewelry which can be as much fun as wearing and collecting it! Knowledge is definitely Jewelry Golden! 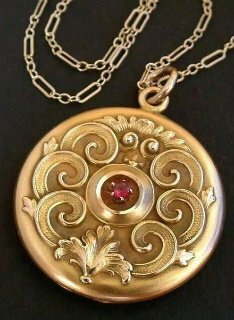 To learn more date and value tips and how to invest in Antique and Vintage Jewelry & Collectibles from the Victorian Era into the 1960s, check out Sharon's shop at Rubylane - YEARS AFTER Shop. YEARS AFTER at Ruby Lane have been dealing in Antique & Vintage Jewelry for over 25 years and offer a Wide Selection of Authentic Victorian, Edwardian, Art Deco, Fine 14K Gold and Silver Jewelry, Vintage Plastics such as Antique Vintage Bakelite, Celluloid & Lucite Jewelry, Kitchenware Utensils, Purses, Dolls & Clothing, Wedding Gifts.